To cold to use the smoker….this was a teaser til spring. It was good. Coat with the dry rub. 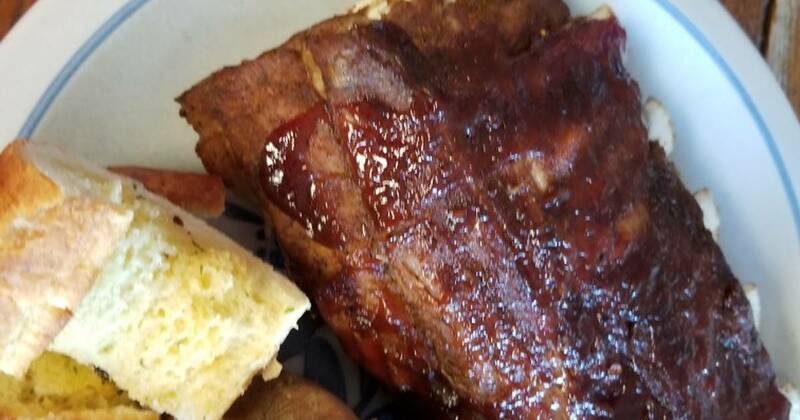 If you do this early enough, put ribs on plate, cover with plastic wrap and refrigerate. If done spur of moment let rest at least 30 minutes. Place trivet in bottom of IP, add liquid ingredients EXCEPT BBQ sauce. Stack ribs on the trivet on their side next to one another. High pressure cook for 30 minutes. Do a natural release. Baste with BBQ sauce and broil for 5-7 minutes. This finishing touch actually makes the ribs in my opinion.